The Carl Moyer Program (CMP) is a grant program that funds the incremental cost of cleaner-than-required heavy-duty diesel equipment that reduces nitrogen oxide (NOx), particulate matter (PM10), and volatile organic compounds (VOC) emissions from diesel-fueled engines. Although air pollution regulations have significantly reduced diesel emissions and improved air quality across the state, many areas of California continue to experience unhealthy air conditions. Diesel exhaust is a serious public health risk, considered the number one airborne carcinogen in California, responsible for approximately 70% of cancer risk in California from toxic air contaminants, and a major contributor to lung and heart problems. The CMP complements California’s regulatory program by providing incentives to obtain early or extra emission reductions. CMP clean air projects involve a wide variety of vehicles and equipment. A detailed discussion of the types of projects funded over the years can be found in The Carl Moyer Program Status Report [ARB 2007]. Typical types of projects are listed below. Funding is based on eligibility and cost-effectiveness of the project which is determined by engine/equipment type, hours of operation, and project life. Emergency equipment (fire apparatus) as described in the California Vehicle Code, sections 27156.2 and 165 including, but not limited to pumpers, ladder trucks, and water tenders are eligible for funding. Eligible projects are those in which a new or used replacement vehicle with an engine meeting the current model year California emission standard replaces an older, more polluting fire apparatus. The older, replaced vehicle must be destroyed. Eligible weight class include heavy-duty diesel fire apparatus with a gross vehicle weight rating (GVWR) greater than 14,000 pounds. Grant funding for a fire apparatus project shall not exceed a maximum of 80 percent of the eligible project cost. Eligible project costs include the cost of the cab and chassis and do not include the specialized equipment such as the ladder or pumper. Emission reductions funded through the CMP must be real, surplus, quantifiable, and enforceable in order to meet the underlying statutory provisions and to be SIP-creditable. The requirements in the Carl Moyer Program Guidelines are intended to ensure that these core principles are met. To ensure that projects are surplus to regulations, funded projects must not be required by any federal, State or local regulation, memorandum of agreement/understanding with a regulatory agency, settlement agreement, mitigation requirement, or other legal mandate. A minimum project life, which is determined by project type, is required to ensure that the program does not fund actions taken to comply with regulatory deadlines. The minimum project life helps ensure the overall cost-effectiveness of the program and establishes that the emission reductions are real and quantifiable. 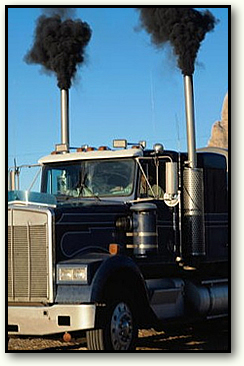 Emission control technologies must be certified or verified by the California Air Resources Board (CARB) (or for some categories the U.S. Environmental Protection Agency or International Maritime Organization) to ensure that real, quantifiable emission reductions are achieved over the life of a project. Emergency equipment replacement: replacement of an older vehicle or piece of equipment that still has remaining useful life with a newer, cleaner vehicle or piece of equipment. The old vehicle/equipment must be scrapped. Engine repower: replacement of an existing engine with a new, emission certified engine instead of rebuilding the existing engine to its original specifications. Retrofit: installation of a verified emission control system on an existing engine. Examples include, but are not limited to, diesel particulate filters and forklift catalyst systems.